We asked a few of our storytelling friends to share the Thanksgiving recipe they can’t live without. From before-dinner drinks to the perfect dessert, we’ve got you covered! Best of all, most of these recipes will do double duty through the rest of the holiday season. Do you have a favorite Thanksgiving dish? We hope you’ll share it with us in the comments. Corinne says: I started making this mulled spiced cranberry-wine drink for our family’s Thanksgiving more than 40 years ago. We’ve changed the location of the dinners over the years, but we always start with what I call “Wassail” to drink with the appetizers. We gather at our cousins’ home in a Chicago suburb now, and I make two batches—one with wine for adults, and one without for the kids. This is a no-fail recipe that can be altered to different tastes. It really adds a wonderful aroma to the pre-meal game watching! Combine the cranberry juice, water, sugar, lemon, and mulled spices in a large pot. Simmer for 15 minutes or longer. Stir in the wine and heat through. Serve warm. This recipe comes from the late Kathryn Windham’s cookbook, Southern Cooking to Remember. With thanks to Kathryn’s daughter, Dilcy Windham Hilly! Melt the butter in a heavy skillet. Cook the pecans over medium heat until they’re crisp, stirring frequently. Remove the nuts to drain on paper towels, and set aside. Blend the cornstarch and the water in a small bowl. Stir the mixture into the butter in the skillet until it forms a smooth paste. Slowly add the sugar, the orange rind, and the orange juice, stirring as you go. Cook over medium heat until the mixture boils. Add the sweet potatoes and warm through, coating with the sauce as they cook. Serve topped with crisp pecans. Judith says: As an avid gardener, I’m always able to grow leeks and some other parts of this dish, which remind us of the holiday’s roots. All the veggies can be found in a traditional New England garden, and it feels just right for the celebration of harvest. I recommend making it a few days ahead of time. It gets better in the fridge! In a large flameproof casserole dish, cover the beans with water. Bring to a boil. Reduce the heat and simmer for 1 hour or until the beans are tender. Set a colander in a bowl and drain the beans, reserving their liquid. In the same pan, heat the oil. Add the leek, zucchini, bell pepper, and garlic and cook over medium heat, stirring often, for 10 minutes. Add the beans, 1 cup of the cooking liquid, maple syrup, thyme, and allspice. Bring to a boil, reduce the heat, and simmer for 10 minutes. Add the corn and additional cooking liquid until it resembles a thin stew. Add salt and pepper to taste and cook for 15 to 20 minutes or until the corn is tender. Serve warm or at room temp. Adam says: Thanksgiving has always been my favorite holiday for one simple reason: each side of my family is from a different religion, and Thanksgiving is the holiday that everyone celebrated. In the early morning we would drive way out into the next county and have an enormous country meal for half of the day, interspersed with lots of storytelling. Then we would drive back to the city and visit with our Jewish family, having another large meal and different conversations. As an adult, each year I have a large Thanksgiving dinner party and make sure to have a cranberry challah on the table to represent this heritage. Here’s my recipe (which makes a lot of bread), which I adapted from Jewish Holiday Feasts by Louise Fiszer & Jeannette Ferrary. Make it all, give some away, and for the next morning make the most delicious French Toast you’ve ever had (dip in a mixture of egg, milk, vanilla, cloves, cinnamon, then fry). 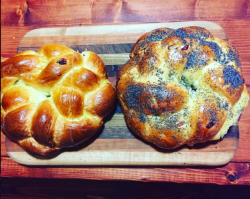 This challah gives you much to be thankful for! In a large bowl, soak the yeast in the warm water. Let sit for 5 minutes while you prepare the eggs. Add the eggs, coconut oil, sugar, salt, and flour to the bowl with the yeast and mix well. Add enough flour to make a workable dough—stiff but sticky. Knead and work in cranberries until it passes the spring-back test. Form into a ball, place in a greased bowl, and let rise until doubled. Punch down the dough. Then decide how many loaves to make. You can make two large loaves, one large and two small, or three medium-sized loaves. Separate dough into balls—one for each loaf you wish to make—and then cut and roll the dough into the number of ropes you need. This dough makes a great five-braid challah, or superior three-braid loaves. If you don’t know how to braid dough then simply roll into a long snake and coil it into a spiral round loaf. If you want to make this extra special, I sometimes take a single braid, roll it into a flat rectangle, fill with a mixture of chopped golden raisins, chopped nuts, citrus zest, and a little honey, and then pinch the dough over the filling to make a tube. What a treat once you weave this strand into the rest! Once the loaf is formed, let it rise until doubled. Brush with an egg yolk wash and a smidge of water. Sprinkle with poppy seeds if you desire. Bake at 375 until it is ready, depending on what size loaves you have made. Check at 13 minutes and then every three minutes after. Serve with honey. Tim says: Thanksgiving finds me deep into rehearsals for Charles Dickens’ A Christmas Carol. Consequently, on Thanksgiving weekend we often stir up a Christmas pudding (just like Mrs. Cratchet!). The last Sunday before Advent often falls during the Thanksgiving weekend and is called “Stir-up Sunday.” Traditionally, Victorian families would make up the pudding on this day. There are all kinds of traditions attached to the making of the pudding. You should stir from east to west because the Wise Men came from the east. You can add a silver coin for good luck. It is said that Queen Victoria, as a reward for hard work and faithful service, dropped a silver coin into the pudding as her cook was stirring it up. And of course, after being stored away in the cupboard for the four weeks of Advent, this wonderful dessert is served flaming, which is lots of fun for all the younger members of the household! My personal addition is a homemade hard sauce. Cream the butter with the sugar, the ground almonds, and the orange rind. Add the brandy and mix until combined. Remove to a bowl and chill in the refrigerator until hardened. Scoop a small ball of sauce to serve with each slice of the pudding. The leftover hard sauce is absolutely delicious melted on hot toast and served with a cup of tea!